Women and children count for over 70% of these victims. Less than 1% of all these victims of slavery will ever be rescued or receive assistance. Far fewer will ever have the opportunity to better their lives through education. Reintegra’s story starts with a man named German Villar and his wife Lorena Argueta who were giving leadership to the Camino a Casa Foundation in Mexico City. German directed the foundation and was the lawyer for victims who were rescued from human trafficking. Lorena directed the home. Together they oversaw the care and rehabilitation of these young women. They created a new home and family for ones who have faced extreme oppression and slavery. Each time a new survivor entered the shelter, German and Lorena encouraged them to dream anew. As each of these women began to dream of what they wanted their lives to become, German and Lorena realized that it was necessary to help make these dreams become a reality. So in the summer of 2012, German launched Reintegra. He rented apartments for the young women who were ready for more independence and helped those who had finished high school to secure scholarships for university studies. German’s vision for this new non-profit was that it be survivor-centered. Survivors designed the Reintegra logo, they choose the name, and it was their dreams and hopes in which Reintegra invested. In October 2014, German died tragically and suddenly. It was soon evident that Reintegra in Mexico could not continue. No one was able to fill German’s shoes and the resources To care for these Survivors were no more. In 2015, Reintegra US was born with the vision of carrying on German’s legacy. We launched Reintegra US in 2015. We were inspired by the life of German, his vision and these women. We began with just enough resources to help two of the survivors that were under Reintegra Mexico's care. 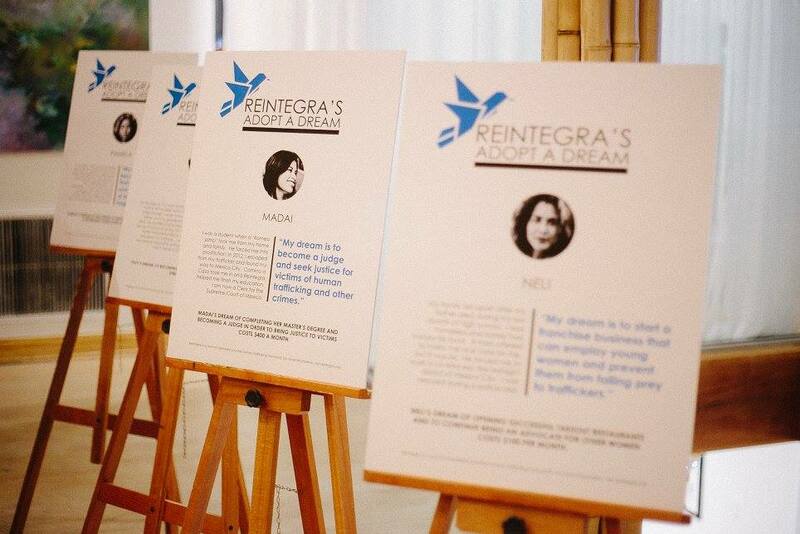 Through generous financial support, Reintegra has grown in the past four years. There are currently eight amazing survivors under our program. Each of them are pursuing their dreams in the fields of law, nursing, finance, business and graphic design. In 2019, we became an Reintegra Int’l as we are continuing our base in the US while relaunching the Reintegra foundation in Mexico. We have leadership in both countries that are working together to help see the reintegration of survivors. And with the growth of our team on the ground in Mexico, we are opening a new transitional home this year in Mexico City in order for younger survivors to enter our program. Noemi speaking at an event on human trafficking at the University of Colorado Law school. There are over 45 million victims of human slavery in the world today. While their visions may lead them on different pursuits with different passions, Each of the women we support are Making an impact on their world. Reintegra women have spoken as advocates to audiences of students, congressional leaders, ambassadors and religious leaders in various places around the globe like Mexico, USA, France, Malta and Vatican City. All of them are role models for younger survivors as well. They give time to serve at the Camino a Casa shelter. Several have been profiled in Forbes magazine as the “Most Influential Women of Mexico” and their stories have been featured on CNN’s Freedom Project and other national publications. While we are amazingly proud of who they are, they still struggle to overcome past abuses. We know beyond finances they need to experience love and encouragement. So it is our desire to continue the legacy of German, not only funding the dreams of these amazing young women, but to become a family to them as well. We desire that they not just receive resources from us but also love and acceptance. We long to celebrate in their joys, walk with them in their struggles and to give them encouragement along the way. As you join us in investing in their lives and dreams through your finances, GIFTS, and time, you are investing in amazing YOUNG Women that we love dearly. THEY ARE MORE THAN Survivors, they are 'thrivivors'. And you not only invest their dreams but in the dreams of unnamed victims impacted by their stories and lives who are hoping against hope for a new life, freedom and the ability to dream themselves.